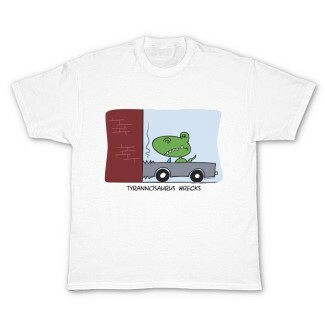 “Tyrannosaurus Wrecks” cartoon dinosaur t-shirt now available over at my Zazzle store. I hope I don;t have to explain this one, but for those cavemen out there, the caption “Tyrannosaurus Wrecks” is a pun playing on the name “Tyrannosaurus Rex”. Get it? Head on over to Zazzle and grab one now, and take a look at the other shirts I have for sale. More coming soon as well!